Note: This post covers the new edition of Blood & Treasure and will of course to some extent focus on the changes from the 1st edition. If you are interested, I did a blog post on that a few years ago, which you can find here. Availability: No free version. Full art PDF and print versions (paper- and hardback) at LULU. PDFs only at RPGNow. Form factor: Good looking color cover, b/w books with cool old school inspired fantasy art. The core rules are divided into two books (see above): Rulebook (basically Player’s Handbook and Dungeon Master’s Guide in D&D terms) and Monster (Monster Manual). The books are clear and well-written, having a higher crunch than say Swords & Wizardry Complete, but still on the simple side of things. Community: Support for B&T is mainly by the author himself on his blog. There is also a little-used forum, and two G+ groups: Blood & Treasure RPG (B&T exclusive) and Land of Nod (about all John Stater’s games). Product support: Good. Mr Stater runs his publishing as a one man show, but he is ridiculously productive. Sadly, the OSR community haven’t taken Blood & Treasure to their hearts like some of the more prolific OSR variants. As far as I’m aware, I am the only one who have published 3rd party adventures for B&T (1st edition) under my fictive publishing house Lazy Sod Press. There are also 3rd party sourcebook style PDFs from Tanner Yea over at Old Soul Games. However, there are no 3rd party products yet for the 2nd edition of B&T. Tinkerability: Very good. And not very much in need since the rules cover most situations that will come up in-game. Compatibility: “Excellent Smithers, excellent….” I’ve mostly used Frog God’s “Lost Lands” materials for my B&T games, but also stuff written for LotFP, D&D 3e, Pits & Perils and Labyrinth Lord. And it all just works, with a minimum of fuss. Flavor: If B&T 1e was Pathfinder light mashed up with Swords & Wizardry, B&T can be said to be the same, but with added emphasis for Swords & Wizardry and old D&D and just some concepts retained from Pathfinder. Classes included*: Assassin, Barbarian, Bard, Cleric, Druid, Duelist, Fighter, Magic-user, Monk, Paladin, Ranger, Sorcerer and Thief. Races included: Human, Dwarf, Elf, Gnome, Halfling, Half-Elf and Half-Orc. 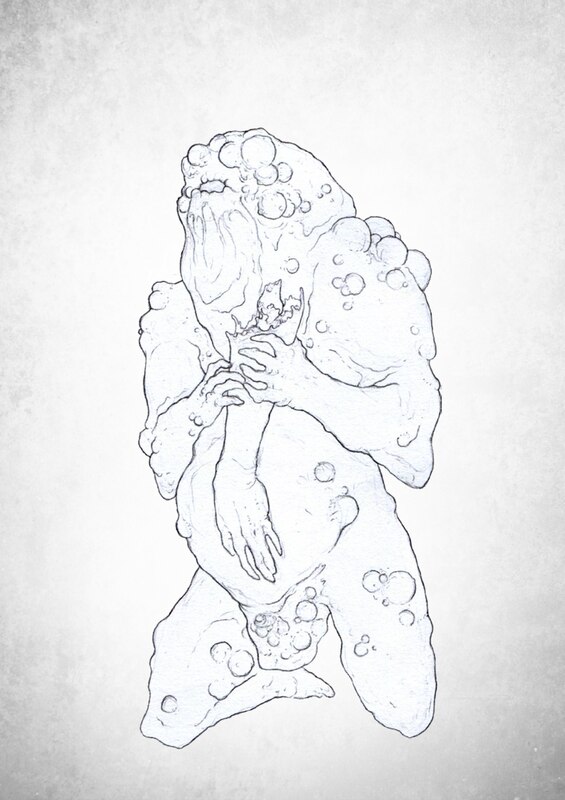 Several of the monsters are also given PCs statistics and are usable as player races at the GMs discretion. Demi-human class and level restrictions: no restrictions for class or level, but restrictions on multi-class combinations for demi-humans. Class requirements: Yes (i.e to play a monk you have to have Strength 12, Wisdom 13 and Dexterity 15). *All the classes also have a class variant included in the book. For example, the Assassin can be modified to a Bounty Hunter, Magic-Users can be Specialist Mages (Evoker, Conjurer etc) and Clerics can be Specialty Clerics (Death Cult, Creation Cult, Scholar Cult etc). Most of what I wrote about Blood & Treasure 1st edition is true for the 2nd edition as well. This post is more about the changes between editions. For ease of reading I include the 1st edition blurb below (last in the section). Now on to the 2nd edition! After reading the books (haven’t played B&T 2e yet) the thing that strikes me the most is that B&T now feels more like it’s own game rather than an old-schoolized variant on the 3e SRD. The 3e-isms are still there, but more hidden under the hood. The game has also taken a few steps back towards old school tropes. 0-level spells. These are now moved to the 1st level spell list. The 3 saves are also gone, in favor of a single save a la S&W. Variation is instead by various situational bonuses like death, paralyzation etc. Very old school. Individual xp charts. Previously, there were four charts covering all classes. All classes get new cool and (unique for B&T) abilities at level 6, further making the game stand out in comparison to other OSR variant games. All in all, the game has been tweaked back even further towards old school aesthetics and I think that many of the overpowered things (mainly found out in play by some of my more ambitious players) have been cast out. The rules have been streamlined even more from before and I think it’s a very good OSR rule set: B&T 2e is as simple as S&W Complete, but it comes with lots of options, which I think is missing from most “simple” variants of OSR style games. Lots of classes, gear, spells and monsters. The books are also much prettier, with snazzy color covers and good interior art. Layout and graphical profile has also improved. The old books were good and working, but never pretty. However, I’m going to miss the “Complete Tome” book variant with all the rules in one mighty book. Another change is that the PDFs now are bookmarked. Very good and a must if you use PDFs at the gaming table. (I did my own bookmarking of the old complete book PDF and it was a boring job, but it also increased the use of the PDF immensely). What I’m less fond of is the new saving throw system. The 3-save system is very easy and logical to use at the table and I can imagine that both me and my players will forget or look frantically in the book when it comes to saves. I also liked the simple xp charts from before. I never understood the charm of separate xp charts even if I get the idea behind the concept. However, I’m sure that the new B&T, with it’s more “back-to-the-old-days” approach might appeal to more old schoolers than the first iteration. And hopefully we will see a rise in Blood & Treasure GMs and players. And more 3rd party products coming out as well. In conclusion, Blood & Treasure 2nd edition is a prettier, more user friendly and more old school version of an already awesome game. Well done Mr Stater! “B&T has the cool stuff from 3.X added in the base package, in a clean and simple way. Many times these rules are optional, and you can skip them without breaking the game. This is the main strength of B&T in my opinion. You can play it 0E style or as 3.X light. As much as I love the simpler rules of earlier incarnations of the game, that simplicity often goes hand in hand with fewer options: few races, few classes, small armor and weapons lists, small spell lists, small monster lists and so on. And this is cool in a minimalistic way, but I like options. B&T provides a simple core rules engine, with a few cool optional add-ons if you like. And LOTS of stuff: 600+ spells and 500+ monsters! In one (or two) book(s)! Heroic tasks – there’s a simple skill system included. Basically, different class and race abilities are codified into skills. Different classes get different skill packages at character generation, which gives them an edge trying to accomplish certain tasks. Everyone can try the tasks, but with different chances for success. If you’re unskilled, you roll a d20 against a target number of 18. Next level of expertise is to have a knack for a certain task. Target number then is 15. And if you have the skill, you roll against the relevant saving throw for that task, so as you go up in level your chances increase. In all these instances your ability modifier is added to the die roll. Difficulties are assigned by the GM in -2 increments. To illustrate: there’s a Heroic Task called Bend Bars, and it uses the Fortitude save + the Strength modifier. An unskilled PC would roll 1d20 + his Str modifier vs a target number of 18, while a skilled PC would roll a d20 + Str modifier vs his Fortitude save target number. The only skills that I miss personally is some kind of First Aid/Healing skill and some kind of general Lore skill. There’s also an optional system for letting PCs buy skills with skill points Pathfinder style. Feats – If you like, there’s a list of about 30 feats that can be used. These are simple, and basically allows for some character customization. They never give more than +1 to stuff. You get a feat at 1st level, and then a new at 4th, 8th, 12th and 16th level. Or use whatever increments that you like. I’ve also added the ”old school feats” (originally written for S&W). Combat maneuvres – The combat system includes rules for some maneuvers/stunts. Basically you roll to hit against a fixed target number. If successful the defender gets a save. If he rolls bad, your stunt succeeds. Tactical advantage – Instead of fiddly rules for different situations, there’s a tactical advantage rule. If the attacker has an advantage he gets +2 to hit. If a defender has advantage, he gets +2 to AC. What constitutes an advantage is up to the GM, but examples could be higher ground and things like that. Guns – If you want to include black powder weapons in your game, the rules are there. Challenge levels – B&T uses a variant of challenge levels, just like S&W. These are used to compute Encounter levels, which forms the base for computing treasure. There’s also sound advice in how to convert to and from other OSR games, how to construct or reskin monsters, rules for domains and large scale battles and even a section on monster templates. Power levels are toned down from 3.X power bloat, and are more in line with older editions of the game. These things might not be to everyone’s liking, but as I said earlier – cut away stuff you don’t like. Some might say that B&T isn’t an OSR game, but I think it’s just that. Or OSR+. Or whatever you want to call it. Physically, the books are LULU standard. There’s a Player’s Tome and a Treasure Keepers Tome and a Complete Tome with all the rules in one book. I have the Complete Tome and a copy of the Player’s Tome to use at the table. The only thing I miss is an index. If the races and classes in the book(s) aren’t enough for you, there’s a PDF of new races and a PDF with lots of new class variants (5 of each base class). Both can be found on the author’s blog. Also, the excellent OSR magazine NOD has a bunch of new classes, spells and monsters and the author regularly posts new material on the blog. There’s also a section describing the game and the mechanics here (see Origins and Nuts & Bolts). Some downsides to B&T are the problematic multi-classing thing. B&T has an elegant way of dealing with multi-class level advancement. They use a separate level table regardless of class. The problem is that even if xp requirements are the highest, the multi-classes are going to get much mightier than plain ol’ single class characters. This has been discussed on the forums, and the author has written down a few official optional methods for handling multi-class character leveling that should take care of that. Another thing is that the only class that gets multiple attacks when leveling is the fighter. That leaves the other Fighter subclasses in the backwaters in comparison. And if you look for that old school esoteric writing style or Lamentations style evocative writing – there’s none of that here. The book(s) are very well written in short end effective prose, but that also makes them a bit non-personal and generic. Naturally, this is a very subjective point, but it’s one that I’ve thought about. Sadly, I don’t think that this game has attracted nearly enough attention on the OSR scene, and this might be due to the fact that there’s no free version of the game. The PDFs and books are reasonably priced, but people are reluctant to pay for gaming stuff when there’s so much free stuff going on. Sad, because I think a lot of you guys would love this game if you see past it’s 3.X connection. All in all, this feels like AD&D done right. Or 3.X as it should have been done. For me, the simplicity of the rules, coupled with the completeness and multitude of stuff, makes B&T my main choice for my new OSR campaign with my main play group. The book has been on my nightstand since I got it and I find that I return to it ever so often to look up stuff. I made these player handouts for my own current Come to Daddy game and decided to share them. There is on containing a summary of the Ritual of Banishment and one summary of what can be gleaned from Torgil’s Journal. Available for free from DriveTHRU RPG or from here. Don’t know what “Come to Daddy” is? Check here. For a while now I’ve been wanting to write a Game Master report on Blood & Treasure. I mean, the game looks great on paper, but how does it work in real play? I have used Blood & Treasure Complete as the game engine for my latest D&D style game. First a few one-shots to try it out, then for my current campaign set in Frog God Games Lost Lands setting. As usual I’m taking liberties with the “canon” so up to now I’ve put in stuff written for Pits & Perils as well as Lamentations of the Flame Princess. I also use my own added variant rules (such as horror/sanity) et cetera. When I first started I had decided to stick to the core classes and races, but then I decided to let the dogs of war free in this game and so I allow most of the classes and races in NOD Companion as well as the class variants found in Heroes of Lore. Some of the playable monsters from the monster section is also allowed. I have also raised PC hit points by one die (so if your Cleric rolls a d6 for hit points, it’s now a d8) to more or less AD&D standard. At the same time monsters no longer use d6 for hit points, but variable HD according to size. We also use the skill system (named Heroic Tasks in B&T) as well as the Feat/Talent system, and they do not take anything from the play experience as they are simple and easy to use. (Both of these are however optional and can be easily left out if you want a more old school-ish experience). In a sense this particular game is all but traditional OSR. On the other hand the players have a lot of freedom of choice to create and play a different character if they like. My fears that this would slide out of hand was unfounded because most of the current characters are plain vanilla ones out of the core book. And both the aesthetics and play style is very old school, just like we did it back in the day. So how does it work out then? I must say excellent! Despite using modern game concepts, the game flow is very old school and we have a lot of fun. The PCs are definitely tougher than their OSR cousins, but on the other hand I can throw harder challenges at them. And if someone dies, making a new character is very quick. On-the-fly conversion from Swords & Wizardry or Lamentations of the Flame Princess is also easy, especially from S&W. Being a huge d100/BRP fan I also appreciate the skill system as it matches very well with my GM style. Complexity-wise, the game feels like Swords & Wizardry with added 3e-isms like 3 saves, ascending AC and so on. The extra rules crunch is absent though, as is the elevated power level of 3e, as the author has tuned down the power level to about AD&D. Being a game that “lives between editions” has also made it an easy sell to all ” edition camps” in my play group. Both old school as well as Pathfinder afficionados like the game. In other words it’s a good middle ground for fans of all flavors of D&D. Some compromises, yes, but acceptable to most players methinks. The mix of ideas from all editions incorporated into the game also makes for pretty easy compatibility both with older as well as newer editions of the game. About the only thing I’m not 100% happy with is the Heroic Task (skill) system. It was written to function both as a 3e style skill system as well being backwards compatible with x-in-6 chance system of old. I think that it matches the x-in-6 chance system best and it doesn’t give the GM all the tools to vary skill challenges as much as I like. Anyone can try any skill/task. Unskilled (static target number 18 to succeed). Knack (static target number 15 to succeed). Skilled (dynamic target number equal to the saving throw category connected with the task, for example Bend Bars is connected to Fortitude). It also gets better as you level up since the save number will decrease. What happens in play is player confusion among the player’s when they have a skill and struggle to find the correct save category. We have discussed this in the group and all the players agree on this. As a GM it’s also confusing, since the skills are named after the old school abilities like Bend Bars, Hide in Shadows etc. Which one do I use when a player says that he scans the horizon for any movement? I’d say Perception but there’s no such skill so I have to look for one to use consistently whenever someone wants to try something in the Perception-y area. Not always 100% clear. I have made some rule hacks and conventions regarding this, but I still think the system is clunky if you intend to use it as a skill system. If you use it the old school way, it makes perfect sense though. Another thing I’ve noticed in play is that some of the Feats/Talents are a bit overpowered (at least for my tastes) despite that the author has nerfed then a lot from their 3e counterparts. This especially goes for the Two Weapon Fighting feat which we now have toned down even more. As there’s a new edition of Blood & Treasure in the works, I hope that the author will incorporate some simpler rules variant for the skill/task checks. To summarize, I couldn’t be happier with a rule set than Blood & Treasure. It is simple to GM and both flows and feels like the old school games we used to play back in the day, but with some cool newer things added. I also appreciate how easy it is to exclude things that you don’t like or if you want to add things from another OSR game. And the wealth of monsters, spells and gear in the core book is massive. Blood & Treasure is easily my go-to OSR game as it can take the place of both older and newer editions of the game with ease. Moreover, it’s lightness on rules makes it very easy to run at the table. And it lets your GM juices run free when creating adventures, letting you do things with ease and not get bogged down in a mire of esoteric rules. It also lets you run your old B2 module along with newer 3.x/Pathfinder module, although newer stuff demands some conversion beforehand. Older materials and OSR adventures can be run off the cuff as is. I just love this game and have high expectations for the upcoming 2nd edition! A while back, we played the excellent body horror adventure The Sleeping Place of the Feathered Swine by Logan Knight (see his blog Last Gasp here). I inserted it into my Blood & Treasure Complete game set in the Lost Lands (by Frog God Games) and it was a blast! We’re currently running Stoneheart Valley, but I’m using it as an extended sandbox so we’ve had a lot of adventures not detailed in that book. It’s a pretty standard D&D fantasy world, albeit on the low fantasy side if compared to for example Forgotten Realms. A bit like Greyhawk with some Realms of Crawling Chaos thrown into the mix if you will. As the players were in the “standard fantasy D&D” mindset, this little gem of an adventure really threw them off their feet! Special: Fortitude save to avoid being infected by worms on any contact with the Tumors or their bodily secretions. For those interested in reading about our exploits in the Lost Lands, there’s a series of session recaps here. Be forewarned of spoilers, though. And now – back to my new adventure!